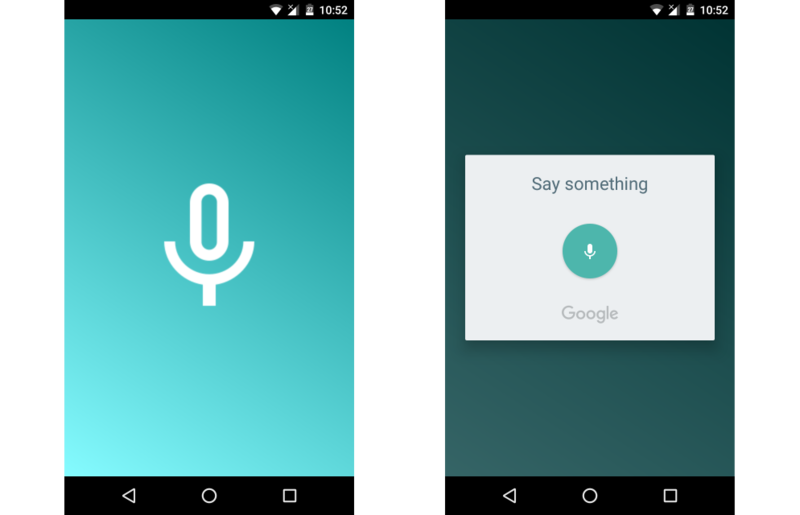 In this tutorial I will show you how to create a simple Android App that listens to the speech of a user and converts it to text. The app will then analyze the text and use it as a command to store data or answer the user. The application user interface is simple, just a single ImageButton in the center of a full screen gradient background. Each time a user speaks, they press the button and talk. You can find the final project on Github. Create a new project in android Studio, choosing a minimum API level of 18 and adding an Empty Activity. This will be the only activity in the project. To make the view full screen, open AndroidManifest.xml and set android:theme="@style/Theme.AppCompat.NoActionBar". This will hide the ActionBar from our Activity. Feel free to change the colors and angle to your own. The ImageButton inside the layout uses an image from Material Design Icons. Download and add it as a src. Now the user interface is complete, the next step is the Java code inside MainActivity. This starts the TextToSpeech service. The speak() method takes a String parameter, which is the text you want Android to speak. At this stage, the application speaks “Hello” once started. The next step is to make it listen. This method starts the listening activity which displays as a dialog with a text prompt. The language of the speech is taken from the device, via the Locale.getDefault() method. The startActivityForResult(i, 100) method waits for the current activity to return a result. 100 is a random code attached to the started activity, and can be any number that suits your use case. When a result returns from the started activity, it contains this code and uses it to differentiate multiple results from each other. At this stage, the application can listen after a user clicks the microphone button, and converts the user’s speech to text. The result is printed in the Error Log. To make the app more interesting, in this step you are going to make the application able learn simple things, like your name. To make this possible, you need to use local storage. You can use a simple logic here, so when someone asks “What is your name?”, the answer is “My name is Dori.”, taking the name from the answer. A simple way is to split the answer’s string by spaces (” “) and get the value of the last index. The recognition method uses all the results from the user’s speech. Since the speech may be different, you can differentiate them using certain words they might contain. But this is still a simple interaction with the app. You could make it learn your age, or even give it a name. //Just speak: I am x years old. //Ask: What time is it? In the GitHub project I have included more examples for you to experiment with and build your own Android assistant. I hope you enjoyed this tutorial and have a useful conversation with you phone. Any questions or comments, please let me know below.